Spa Lady Duck’s Ducky Friends? There is an odd phenomenon on Facebook right now. People post an image like this one that is a list representing different “types” of people or personalities. Then they use a feature called “tagging” to indicate which of their friends they think fit each fo the types. This tagging process notifies those tagged friends who are then supposed to post the image themselves and tag their own friends OR they can simply untag and retag themself as well as tag others. I’ve not played this particular “game” — though I did do the “25 Random Things” deal. Strange how this on-line world has fads that last about a week (strong) and are nearly gone in a month. Yeah, if you’re not familiar with Facebook or tagging, this is way to complicated to care about. Sorry. Of the dozen or so of these I’ve seen recently, this one made me actually giggle. It’s the ducks. 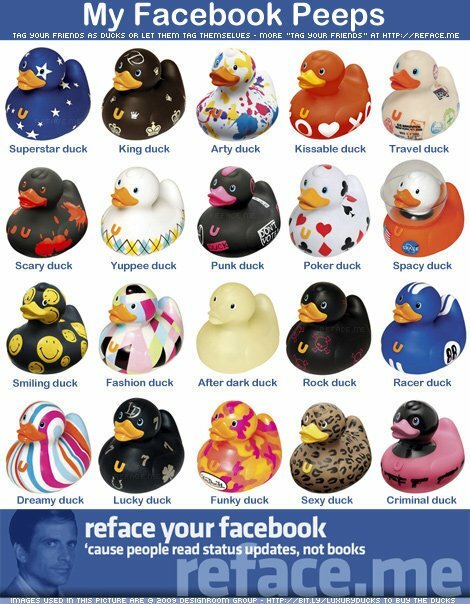 They remind me of my dear friend, Spa Lady Duck. I posted this here mostly because I think she’ll enjoy seeing it. I’ve seen the Little Miss/Mr Men one going round, although have not been tagged in one as yet!! Loving the ducks, though.